This is the second of three posts I intend to make related to my talk on “Managing your Product Management Career” at ProductCamp Boston. The first post was about assessing your product management skills. Now that you have accurately assessed your product management skills, it is time to think about how to market yourself. Before the advent of the internet, all you needed was a resume. You created one, mailed it to different companies when you were applying for an open position. Unfortunately, in the current world, resume is still required but is grossly insufficient. It is not good enough to stand out in a crowd of product managers. You need to “market” yourself by creating digital assets online. This does not mean that you post your resume on every job site you can find on the internet. Instead, you need to create your own digital assets online that market your personal brand. You also need to take advantage of social networks such as LinkedIn, Facebook. I, as a hiring manager, for instance first does a Google search on a candidate’s name before paying attention to the resume in hand. I want to fLinkedIn ind out what comes up about the candidate online. This can be used to your great advantage if you create a great portfolio online. Here are some things you can do to create a great digital presence for your personal brand. 1) Start a blog: It does not necessarily need to be on product management, but something that your passionate about. If it is cooking, so be it. If it is horse racing, so be it. What I want to see is your passion, your writing skills and ability to take an initiative and keep up with it. For example, this blog is a big part of my personal brand. It is the first thing that usually comes up when you Google my name. Now, a word of advice. There is nothing more to turn off people (at least me for sure) than seeing a blog which has 1 or 2 articles written months back. This is akin to seeing a real estate property in a dilapidated state. You would be better off by not having a blog if you cannot keep up with it. Otherwise, you come across as someone who starts new things and loses interest. 2) Write a guest blog post or comment on other’s blogs – If you feel that you are not ready to start your own blog, look for opportunities to do a guest blog post on existing blogs. I for one is always looking for guests to write about product management on this blog. If you think you have good content, contact me. If you think you are not ready to do this yet, then start commenting on other’s blogs. By this, I do not mean that you leave a comment of “Great post” on many blogs, but instead enrich blog posts by sharing your opinion with others. 3) LinkedIn – If you are not LinkedIn, create an account now. If you are on LinkedIn, make sure your profile is up-to-date. Treat it as your online resume. LinkedIn does a very good job on doing search engine optimization of member profiles and invariably it is something that comes up when you Google someone’s name. Do you have recommendations on LinkedIn? 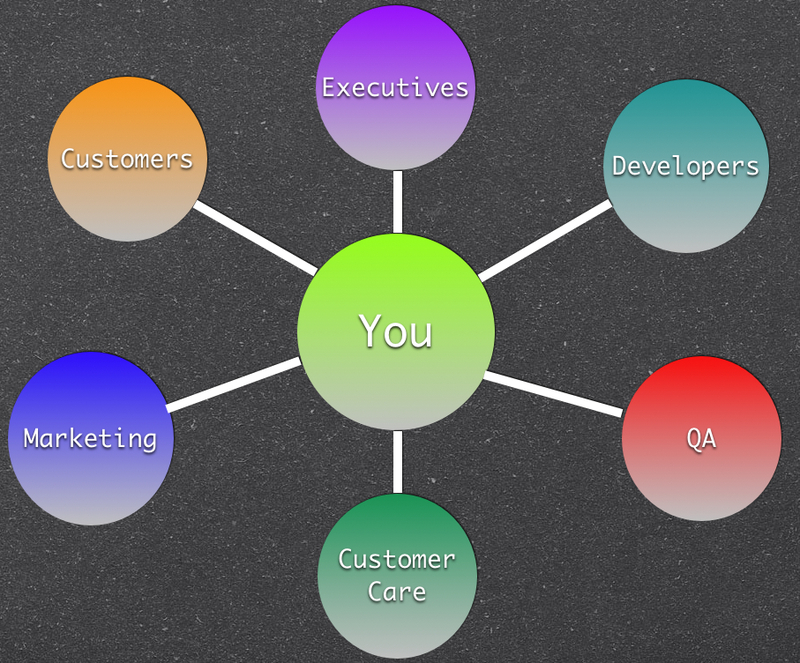 Product managers interact with customers and all internal stakeholders as shown below. Make sure your recommendation gives the viewer a 360 degree view. Get recommendations from all these groups you have worked on. Don’t go overboard and get say 10 recommendations for each job because too many can turn off people as well. I would say 2-3 per job are good enough. There are also so many product management discussions groups on LinkedIn. Join these groups, post any questions you have and get free expert advice from the product management community. Also contribute to existing discussions. 4) Speak at events or attend events: If you have a local product management association or product camps, take advantage of these opportunities to speak at these events. Many times, these events will be publicized online and offline and will help you build your personal brand. If nothing else, attend these events and help out by volunteering. Webinars could present another opportunity to build your reputation. 5) Write articles for magazines: Can some of your content be published in magazines. For example, I wrote about understanding market needs through customer visits and had it published in the Pragmatic Marketing Magazine. This article then got read by a large number of product managers and since the magazine is also online, the article gets indexed by Google and comes up if someone searches on my name. Thoughts? Do you have any additional ways you have used to market yourself online? Thanks Gopal, for posting such a informative post. As a wanna-be Product Manager, I was looking exploring my means on how to break into this field; your post exactly answers my question. While I agree that Blogging is the best way to create a digital presence I have my own doubts about it. Will this be a turn-off to the recruiters? Will it help if i maintain separate personal and professional blogs?